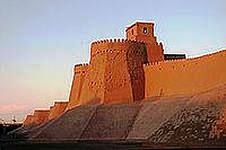 Ichan-Kala city (inner castle) is located in the historical centre of the ancient city Khiva. The territory of Ichan-Kala is 30 hectares. The height of the fortress’ walls is 10 metre. Darwaza (gate) were in each of the four parts of Ichan-Kala: the western gate - Ata-Darwaza are located at Kun-Ark Fortress, the north gate - Bagcha Darwaza, oriental - Palvan Darwaza and south - Tash-Darwaza. Ata-Darwaza is the main gate of Ichan-Kala, located in the western part of the city. The gate was built in 1842 and destroyed in 1920. In 1975, they were again restored. The height of Ata-Darwaza’ door is 10 metre, its width is 4 metre. The fortress Kunya-Ark is located on the left side and Muhammad Amin Khan Madrasa is on the right side. North Gate - Bagcha-Darwaza is a symmetrical structure in the fortress wall, its height is 8.5 meters. There are the stairs on the sides of the southern corners. Eastern Gate - Palvan-Darwaza was built in the years 1804-1806. According to historical data, there was a slave trade in this region. Gate was named in honor of a local poet Mahmud Palvan, who was regarded as the saint patron of the city. "Palvan" means "Hercules." Gate is decorated in the form of arch. It is a stone street with six domes. 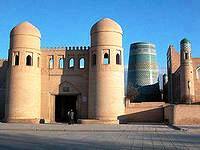 There is an inscription "Shahri Khiva" (Khiva city) at the entrance to Palvan-Darvaza. The construction of the gate was finished in 1835. Criminals were punished here. Local people call the gate – “gate of execution”. South Gate - Tash-Darwaza was built in 1930 during the reign of Allah Kuli Khan. It is a six-chamber building with two domes. There are two massive towers in the south façade. Another four buildings were used for customs and guard. The height of the gate Tash-Darvaza is 9 metre. There are many architectural monuments in the ancient city Ichan-Kala. These are magnificent palaces and mosques, madrassas and mausoleums. The fascinating city Ichan-Kala was listed as a UNESCO World Heritage Site in 1990.